Dogs are part of the family. They're also companions and friends. They give us unconditional love but some days we just don't have the time to give them the attention they need and crave. For those days there is Bark Avenue. We provide a clean, fun place for your dog to socialize and play with other dogs (and humans) during weekday business hours. Simply drop your pet off and our friendly, dog-loving staff will take it from there. While you take care of work, shopping, errands, or whatever your schedule requires, your pet is playing and getting lots of TLC. We provide our guests with physical and verbal praise for good behavior and like to give them lots of back scratches and belly rubs. Going to dog daycare anywhere from once a week to 5 times a week will benefit your furry friend whether he/she needs more physical activity, better social skills, or play buddies. 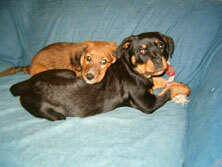 We also assist with house training and socializing puppies. When you pick up your pet at the end of the day, he/she will be ready to go home and relax with your family after a full, fun day at dog daycare. No more pent-up energy as you sit down to read the paper. No more waking you up in the middle of the night. You'll have a pooped pup that is happy to curl up nearby. Sounds good, doesn't it? We look forward to meeting you, and your pet.